Today I will show you how I made the icicle pauldron for my Glaceon gijinka using Worbla and resin casting techniques. It may not be the best, most refined way, but it worked for me so maybe it will work for you too! Naturally, you’ll need a piece of armor! I’m using the pauldron for my Glaceon gijinka, but you could use any kind of armor for your own project. I made mine with 4mm EVA foam for the base shape, covered that in Black Worbla using the folding method, and made the details using Worbla’s Pearly Art. Its pretty standard armor making and you can find tons of tutorials on how to do it just by searching a bit on google or youtube if you need more information on how to do it! To do this, you’ll need sulfur free clay (I’m using Chavant Sulfure Free Plastaline), clay tools, and some water. Prepare the surface of your armor piece by covering it with masking tape. This will keep your armor clean! Then, start sculpting. I wanted my icicles to look somewhat sharp and a bit blocky, almost as if they were cut and carved. So, to achieve this look, I cut chunks of clay out of the block into the shapes I wanted and stuck them together. I also used a small amount of water to smooth out any rough areas. To stick them to the pauldron, I heated the bottom edge with my heat gun until it was soft and stuck it right to the surface of the masking tape. It doesn’t result in an extremely sturdy bond, but it will keep your clay icicles from falling off. Then, we just continue adding icicles until we’re happy with how it looks! Use various clay tools to help you sculpt, and the water to help you smooth. I only used tools with flat edges since I wanted my ice to look sharp, but you can use whatever works best for you! I had never tried casting anything this complex before attempting this pauldron, so I’m sure that my methods for casting this particular piece are not the best or ideal. However, the way I chose to use worked out perfectly fine in the end and if it worked for me, it can work for others too! Now that you have your icicles sculpted, you’ll need to make a silicone mold so you can cast them! The best way I know to do this is to make a brush on mold. Since my icicles were pointing in all different directions, I didn’t think a block mold would be a good option. I wanted to mold to remain as flexible as possible so that I could demold the cast easily once it was done, and a block mold might have hindered that. With a block mold, I would also likely have had to split the mold up into multiple pieces to accommodate all the icicles, so a brush on mold seemed like a better option. All of that, plus the fact that my icicles were on a curved surface, made a brush on mold just seem like the easier and more efficient option. For brush on molds, I use Mold Max STROKE from Smooth on. It has a 100A:10B gram ratio, so you’ll need a digital scale in order to use it. With this silicone you’ll need to brush on multiple layers of silicone, letting each later cure for about 30-45 minutes between each coat, and 16 hours for a full cure once you have the last layer on. If you’re using a different kind of silicone, be sure to read the directions and follow them accordingly. For my mold, I used 50 grams of part A and 5 grams for part B for each layer. If your sculpt is larger or smaller, you may need to use more or less. Whatever you do, just make sure you keep the correct ratio between part A and part B! Otherwise, your silicone might not cure properly and you’ll end up with a mess! After measuring out both parts, mix thoroughly and brush your first layer of silicone all over your icicle sculpt. Do your best to cover the entire surface area, including in between every icicle! Be sure to brush a small amount all the way around the bottom of the sculpt along the pauldron as well! Please note that the silicone can’t be cleaned out of the brush completely, so be sure to use a brush you don’t care about! It will be ruined once you’re done. Once you have your first layer, wait the appropriate amount of time for the silicone to set (for Mold Max Stroke that’s 30-45 minutes). Then, mix up another batch of silicone and brush on the second layer. Repeat this process until you have 4 layers. After the last layer, let the silicone cure completely before continuing. Mold Max Stroke, as said above, takes 16 hours, but if you’re using a different kind of silicone, it might be more or less, so be sure to check the directions! This step is 100% essential! With brush on molds, you have to create some sort of casing over the surface of your mold BEFORE demolding the original sculpt. Otherwise, as soon as you take the original sculpt out, your mold will loose its shape and be nothing but a floppy pile of cured silicone with no way to use it. There are multiple ways to do this, but my prefered way is to use scraps of Worbla! Worbla is easy to use, will take any shape, and sticks to itself, so you can apply it all over the mold just by using some heat. Just take some scraps, heat them up, and stick them all over the mold’s surface. Since my icicle shape is so complex, I had to stick some pieces of Worbla between them to ensure the mold would be able to hold its shape. Once you are done and the Worbla has cooled, you can take the Worbla casing off the mold. You may need to cut the Worbla to get it out, but its easy to stick back together with just another piece of heated worbla once you’re read to use it. Once you have your mother mold, you can finally take out all those icicles! This proved to be a more difficult process than I originally anticipated, but with a little work and patience, I was able to get them all out. With my mold, I wasn’t able to simple pop the icicles out like you would with a less complex mold. I actually had to cut slits down the icicles with an X-Acto knife because otherwise the clay just stuck. This, naturally, left a lot of opportunity for the mold to leak resin. It isn’t ideal, but even so the mold will still work! It just won’t be as clean and easy as it would without cutting all those slits. Side note: I also had a lot of clay residue left behind in the mold after demolding. I attribute this to the fact that I did not use a mold release before applying my silicone, so if you want to save yourself a headache, use a mold release! Once you have successfully demolded the original sculpt, pop the mold back into the mother mold for safekeeping. Doing so will keep your mold from warping and loosing shape. Now its time to cast! I am using Smooth On Smooth Cast 326. You can use any kind of clear resin for this, but it is best to have something that cures fairly quickly. It isn’t 100% necessary, but I use a vacuum degassing chamber with my resin to remove bubbles. I personally have a lot of issues with Smooth Cast 326 bubbling, so the vacuum chamber really helps remove them! If you decide to use a vacuum degassing chamber, be ABSOLUTELY SURE to read and understand any and all directions/warnings. These chambers can be dangerous if not used properly. Always be safe! Now, onto preparing your resin! Start by measuring out part A and part B. The resin I’m using is a 1:1 ratio by volume, so I need equal amounts of each part. Before mixing them, add in any dye you want to ONE part! Clear resin has one part that has a slightly yellow tint and one part that is clear. Mix your dye into the clear part. The dye I’m using (Smooth On So Strong Color Tint in Blue) is VERY strong, so I put a tiny amount into my resin to color it. I want to keep the resin very translucent and light for my icicles, so the less dye, the better! Its best to mix your dye BEFORE adding your two parts together. That way, you’re not rushing to mix the dye before your resin cures! After you’re happy with the color, go ahead and mix both parts together. You’ll probably notice as you mix that a lot of bubbles pop up throughout the resin. This is where the vacuum chamber would come in! I don’t claim to be an expert on vacuum degassing, but the directions that came with the vacuum pump and chamber I bought were very straightforward and easy to understand. As long as you’re careful, read the directions, and follow them, you should be just fine! There are also lots of videos on Youtube you can look up to help you even further! Of course, if you’re using a vacuum chamber, you’ll have to be aware of your resin’s pot life. Please note that pot life and cure time are NOT the same thing. Cure time is the time it takes for your resin to completely cure, white pot life is the amount of time you can work with your resin. So, while my resin has a cure time of one hour, its pot life is only 7-9 minutes. Don’t keep your resin in the chamber too long! Make sure you use it before the pot life has ended. This is where the process got a little tricky for me. In order to demold my original icicle sculpt, I had to cut into it, which left a lot of opportunity for resin leaks. Knowing this, I prepared by getting a large cardboard box, put an extra mixing cup inside it, and poured my resin into the mold over the box, doing my best to catch resin that leaked out of the mold in the cup. Once the mold stopped leaking, I took whatever I managed to save with the mixing cup and poured it back into the mold and repeated the process. This was definitely not the most graceful method, but it worked! I ended up having to mix 3 different batches of resin to fill my mold entirely, and I strategically poured each one so that the resin would cure along the curve of the mold and fit my armor. Once the resin is completely cured, you can take the mother mold off and demold it! You can see below all the slits I had to cut into my mold in order to remove the original sculpt. This caused a lot of resin to leak out, and of course made the casting process that much harder. I’m sure with a bit of research and practice you can find a better way to make a mold for a cast like this if you’d rather have nice looking, drama-free mold. For my purposes though, this was good enough! Above you can see the icicles straight out of the mold! At this step, there is still a lot of clean up to do (especially since I had so much clay stuck in the mold) but with the help of an X-Acto knife and some fine grit sand paper, you can get it looking really nice! Side note: As you can see, I have a dark to light blue gradient in my resin. This is the result of mixing more dye into each batch of resin I poured. You can do all kinds of cool things with the color of your resin this way! Use your X-Acto knife to scrap and/or cut away any clay that was left behind in the mold and to remove excess resin that leaked out. Then, use a fine grit sandpaper will smooth everything over. I also used my Dremel to shape the bottom to fit the armor better. This resulted in a few of the icicles detaching from the main piece, but thats ok! We can always just attach the pieces to the armor separately. Once you have the cast all cleaned up, brush off any dust and spray it with a few layers of clear coat (I use Rustoleum). Be sure to let each layer dry the proper amount of time before adding additional layers! There are always directions on the can for drying and recoat times. Step 9: Prepare/Paint Your Armor. Now that your icicles are done, you’ll need to attach them onto your armor. Before you can do that, you’ll need to prepare and paint it. To start off, you’ll need to make sure your icicles will fit seamlessly. 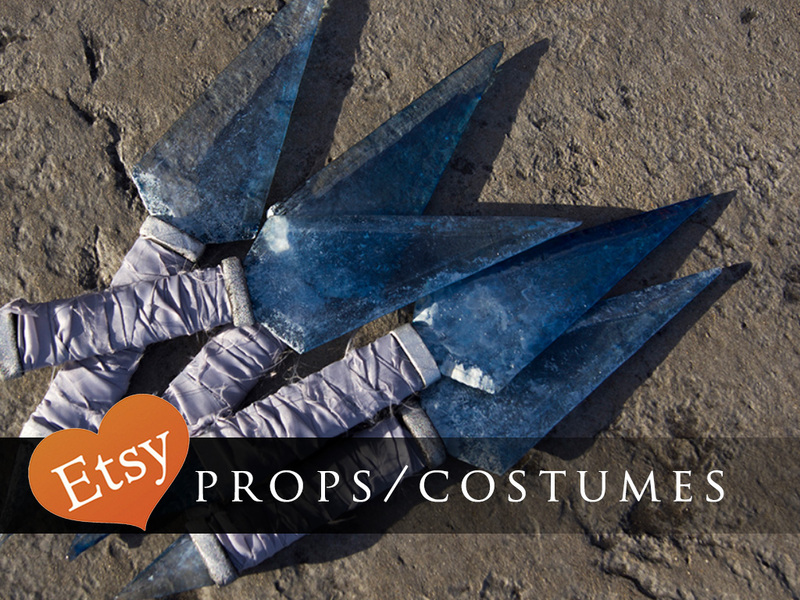 If your armor is made of Worbla, this is pretty easy! Just heat up the area on your armor you plan to attach them and press the icicles into it, making an indentation where the icicles will sit. Once the Worbla cools, pop the icicles off, leaving behind the indentation. This will give you a nice spot to fit the icicles when you go to attach them! There are a number of different ways you can prime and smooth your armor. My personal favorite method is to use Rustoleum’s filler primer! It fills in small imperfections with a enough layers and you can sand it smooth if you choose to! Below is my armor with about 6 coats of filler primer. There is an infinite number of ways to paint armor! You really are only limited to your own imagination, but for the sake of the tutorial, I’ll show you my method. For this armor piece, I start by coating the entire thing with a white base coat. In order to avoid any weird reactions between paint and/or primer, make sure you’re using the same brands for each layer. Since I used Rustolem’s filler primer, I’m also using a white Rustoleum spray paint. Different brands don’t always mix well and can cause issues with drying and can even cause your paint to crack, so be safe and stick with the same! Once that dried, I coated it with silver spray paint, also from Rustoleum. Having the white base coat helps keep the silver looking bright. If I had used black as a base I would have gotten a darker silver. Next, once the silver was dry, I lightly coated the piece with Design Master Tint It Spray Dye in Jade. It is a dye, not a paint. If you’re going to use it, be aware that it is much more “liquidy” than paint is, so be careful with how much you spray on. It can drip very easily. It is best to use multiple light coats to build up the color you want. This great thing about this spray dye is that it is translucent, so whatever color you have underneath it, you’ll be able to see. Since I had silver as a base, the result is a nice metallic jade! You can also layer multiple colors of Tint It to make any color you can dream of! After the dye had dried completely, it was time to add weathering and shadows. To do this, I used Master’s Touch acrylic paint in Payne’s Gray. It is a very dark, bluish gray (almost black) that worked very well for adding shadows for this particular color. I just took a small amount of paint onto a dry brush and pushed it into the crevices and blended it out. Then, I took a small flat brush and darkened the corners with a line. I also used the same color to paint over all the details, giving me a nice surface to apply a new color to them. Once that had dried, I used Rub n Buff Metallic Wax in Silver Leaf to the raised details using a very small, soft brush. To make it really shine, you can buff it once it dries! Last, I added some shadows along the edge of the icicle setting and added some Rub n Buff to the center where the icicles would sit as well. The shading would give the icicles depth while the Rub n Buff would help reflect light through them. This was the easiest step of all. All I did was apply some hot glue to the bottom of the icicles and stuck them on! Further more, I’d also like to note that I did have some bubbles still show up in the icicles even after using the vacuum degassing chamber. I have used the degassing chamber for less complex molds successfully before, so I attribute the bubbles in the icicles to the fact that my mold was extremely wonky and required multiple batches of resin to fill. There were a lot of opportunities for air to get back into the resin as I poured. I suspect that had I not used the vacuum degassing chamber, the bubbles would have been far worse. Even so, the bubbles in this piece do not bother me and I still love the outcome!